When the order to start the invasion had been issued, Sam Browne had already planned his first attack at the vital fortress of Ali Masjid. It lay very close to the border with India and was reached within hours of the declaration of hostilities. However, he was not going to put all his eggs in one basket and launch a frontal attack on such a narrow strip of land. Instead, he split his forces into three columns. One column would advance up the Khyber valley. This column was supposed to act as a holding force until the other columns were in position. The two other columns were sent up a parallel valley called the Lashora valley which ran along the same axis but further north. One of these columns would occupy the heights over the fortress, whilst the other would move to the rear of the position so as to be able to launch an attack from behind the fortress. Success would depend on the speed and coordination of attacks from each of these three columns. Tytler's Second Brigade was the first of the British forces to leave at 17:20 on 20th November. The Corps of Guides led the 1,740 men over the difficult terrain in almost complete darkness. A native guide who had been employed got lost twice, forcing the whole column to retrace its steps on both occasions. The whole force was made more miserable by having to cross the River Lashora on this cold night. To make matters worse, even when they did manage to camp, they were not allowed to light fires in case it warned the Afghans of their advance. When daylight did arrive, matters did not improve for the force. The cold night was replaced by a scorching day and the water that had tormented them during the day was now nowhere to be seen as the column made its way up the treacherous mountain paths. His supply train found matters even worse as the bullocks were forced to march along precarious mountain tracks and paths. By now hopelessly late, Tytler sent on his Corps of Guides and the 1st Sikhs whilst he waited for his supply column to catch up with the main force. By nightfall there was still no sign of his supply train, so he camped where he was. Macpherson's First Brigade fared little better. These 2,000 men were supposed to start a nine hours after Tytler's Brigade had set off. In the end, the First Brigade just got stuck behind the Second's supply column. The roads were of such a poor quality and were far too narrow to take two columns at the same time. Macpherson was forced to wait at Lashora before pushing on. He also had troubles with his supply column and his force was also becoming very tired in the inhospitable terrain. He called a halt at Rhotas completely off the agreed time schedule. Blissfully unaware of the problems facing the two other columns, Samuel Browne's column left Jamrud at 0700 on November 21st. He sent a small body of engineers on ahead to check and improve on the roads if at all possible. Signallers were also sent up some of the mountain sides to facilitate communications. At 1000 hours the first shots of the Afghan war were fired when the 81st Foot came in to contact with an Afghan Cavalry patrol. The cavalry had been monitoring the British advance but quickly withdrew when it realised the size of the force approaching. British troops also pushed along the Shahgai ridge which ran parallel with, but overlooking, the valley. As soon as this ridge was deemed clear, the British artillery batteries opened fire on the fortress. The range was over 2,500 yards and so had little effect. The Afghan guns which opened up in reply were equally lacking in effect, but this was partly because they only had access to round shot, rather than shell. By 1430, nothing had been seen nor heard from the two columns sent up the Lashora Valley. Sam Browne decided that in order to stay to schedule he should launch his frontal attack anyway. He sent Appleyard's 3rd Brigade over the River Kabul to storm a series of entrenchments just south of the fortress. 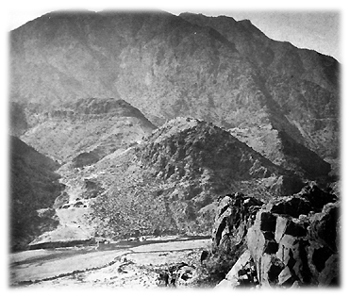 Meanwhile, the 4th Brigade remained on the left of the river to take up a position to the East of Ali Masjid. Both brigades found resistance to be surprisingly forceful. Appleyard's forces managed to gain a foothold on their intended objective, but only thanks to some excellent artillery support by the Royal Horse Artillery. The 4th Brigade made even less headway against Afghans who were determined not to be dislodged. By 1600 hours it was clear that the 4th Brigade could go no further for the time being. They decided to withdraw and fire across the valley in support of Appleyard's forces. However, by 1700 hours it was clear that Appleyard's forces would also be denied their objective. Still with no sign of either of the turning columns Samuel Browne decided to call a halt for the day. By the next morning, Samuel Browne still not had seen nor heard any message from either of the two other columns. Regardless of this fact, he set about launching a second day of attacks. At daybreak the Royal Horse Artillery opened fire on the fortress. They were somewhat surprised when no return fire was offered. Tentative reconnoitering indicated that the Afghan forces had withdrawn during the night. Unknown to Browne, some 300 of the retreating Afghans had been caught retreating by the First Brigade who had finally come somewhere close to being in an attack position. Otherwise, the Afghans had safely withdrawn almost all of their regular forces. A cursory look around the fortress confirmed to the British the difficulties they would have faced had they been forced to storm the stronghold. It was an impressive structure which dominated all of its approaches. The British were somewhat fortunate that the Afghans decided to leave on their own account. However, the British got a taste of what was in store for them in the forthcoming campaign: Hostile terrain; Extremes of temperature; Hardy foes; Supply and Coordination problems. In this particular battle they were lucky that their difficulties were not fully exposed nor put to the test. In the future, they would not always be so fortunate. 20th Nov Hostilities Declared to start next day. 1st and 2nd Brigades move up Lashora Valley in anticipation of attack on 21st. 21st Nov Tytler's Second Brigade gets lost and becomes seriously late. First Brigade gets stuck behind Second Brigade's pack animals, it is also late. 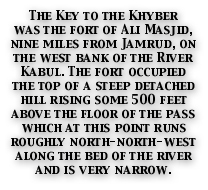 7:00 Sam Browne's force leaves Jamrud. 10:00 81st fires first shots of Afghan campaign at an enemy cavalry patrol. 11:00 Browne's advance guard occupy Shahgai ridge. British Artillery opens fire. Afghans return fire. 14:30 Browne launches frontal attack.Third Brigade crosses river and attacks entrenchments south of fortress. Fourth Brigade advances up eastern side of the river. 16:00 Fourth Brigade's attack stalls. 15:00 Third Brigade still facing strong resistance. Browne calls off attack for the day. 22nd Nov British artillery opens fire. No return of fire. Afghans had departed during the night.